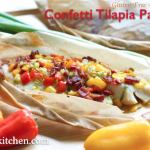 I’m hosting the Gluten Free Menu Swap this week – Woo! We’re focusing on Spring vegetables this month, with this week’s theme being Kale. 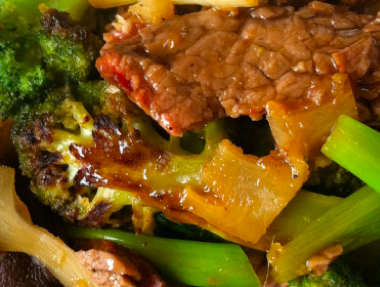 We love that delish veggie in our house. I can’t wait to see how everyone else serves it up. 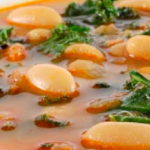 I have a few recipes with kale, such as Chicken, White Bean & Kale Soup, Mongolian Chicken and Veggies, Savory Buckwheat Crepes with Roasted Sweet Potato, Mushroom and Kale Filling, Squash & Kale Pizza, and Kale-idoscope Potato Salad. 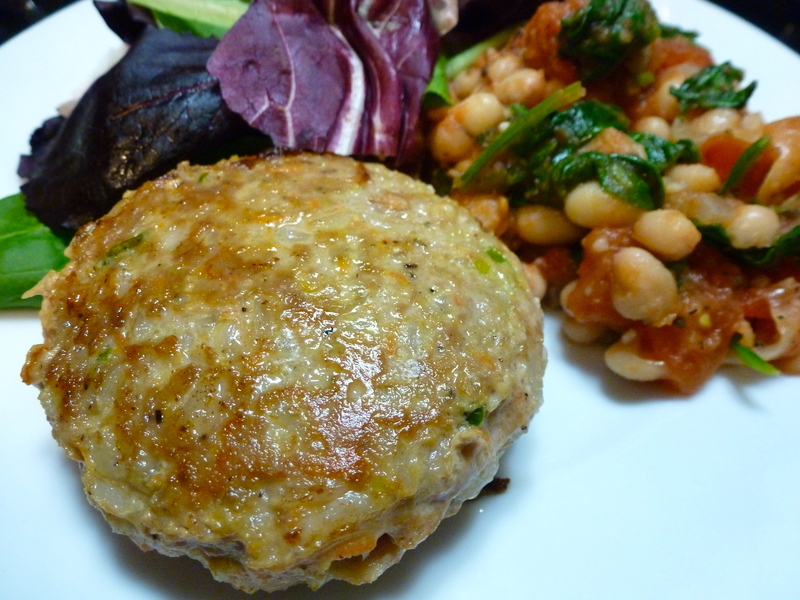 Freezer cooking plan for the week: Quinoa Turkey Burgers and Chicken, White Bean & Kale Soup are making their way into my freezer this week. The week’s breakfast options: Banana Nut Muffins, Hunter’s Breakfast, and various fruits. The week’s lunch options: Nut or sunbutter sandwiches on Amish Friendship Bread, hummus, hard boiled eggs, and various fruits and veggie sticks. 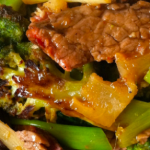 Thursday: Ginger-Beef Stir-Fry with Dark Chocolate Walnut Ginger Biscotti for dessert. What is everyone else serving up? 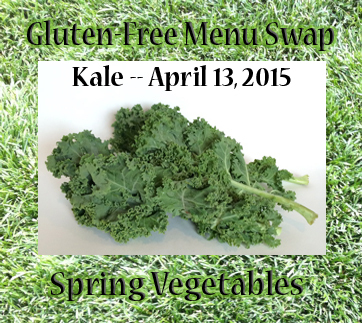 Heather from Celiac Family has a delicious list of kale recipes for us to try. 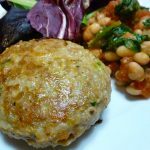 Stir-Fried Kale with Bacon, Amy’s Kale and Carrot Slaw, Squash, Kale and Potato Pancakes, and Sweet Potato, Egg and Kale Stacks are definitely ones I want to try! This week she is serving Egg Salad Sandwiches with Kale and Berry Fruit Salad, Rotisserie Chicken with Mashed Potatoes and Roasted Broccoli, Baked Chicken Nuggets and Kale with Cranberries Salad, Garlic Shrimp Pasta with Kale, Pizza with Strawberry Kale Salad and Nutty Granola Croutons, and Steak Fajitas with Avocado Salsa. Sounds delicious, Heather! Melissa at Mom’s Plans has a tasty menu this week! Moroccan Ground Beef with Tomatoes and Zucchini, Smoked Sausage and Zucchini Skillet, Tuna Noodle Casserole, Old Fashioned Vegetable Beef Soup, and Boy Scout Dinner (Potatoes, Carrots, and Hamburgers in Foil). So yum, Melissa! 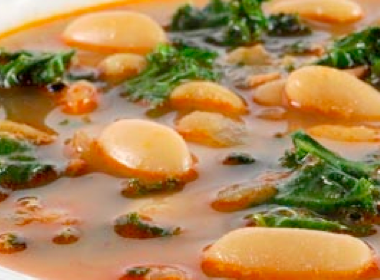 One of our favorite recipes is Chicken, Apple Sausage & Kale soup. It freezes great, so we make it in bulk and freeze it. Yum! 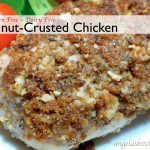 Here's our menu plan for the week: http://www.momsplans.com/2015/04/menu-planning-april-12-2015/ Thanks for hosting! Sounds delicious! I'm definitely going to make that soup. YUM!